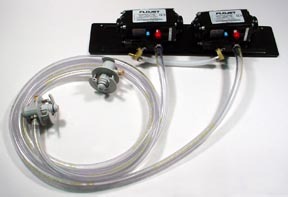 Two (2) Flojet T5000 series pumps with BIB hose and BIB connects mounted on pump panel. Comes with all necessary fittings. Bag-in-box (BIB) hose and connectors are included. Your choice of BIB connector types—mix and match! Panel measures 18" W x 4" H and has predrilled holes for easy installation. Please specify what BIB connectors you plan on using otherwise you get what is shown in picture.